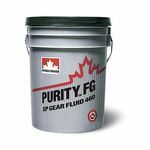 PURITY FG Chain Fluids are recommended for lubricating all types of drive and conveyor chains as well as bearings found on food processing machinery. They may be applied by brush or drip feed as well as by centralized lubrication systems. 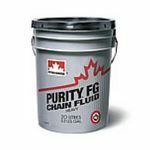 PURITY FG Chain Fluids may be applied at temperatures up to 200°C / 392°F. However, at temperatures above 150°C / 302°F, equipment should be re-oiled more frequently. 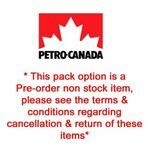 Minimum quantity for "Petro Canada Purity FG Compressor Fluid 32" is 1.
deodourizing and the heating of deep frying oils. 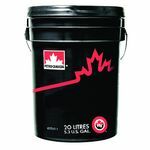 PURITY FG Heat Transfer Fluid may also be used in heating baths where a virtually odourless, nontoxic* fluid is required for worker health and safety. PURITY FG Heat Transfer Fluid’s outstanding resistance to oxidative breakdown is also beneficial in food related manufacturing operations where exposure to air can not be avoided, and oxidation is the most likely form of fluid degradation. Common applications include the manufacture of plastic bottles, films and containers for the packaging of food products. 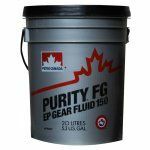 PURITY FG Trolley Fluid is recommended for lubricating hook and trolley systems in meat processing operations. 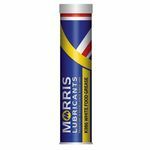 It can also be used as a low viscosity lubricating fluid for chains and conveyors, and as a rust protective oil. PURITY FG Trolley Fluid may be applied by submersing trolleys in a heated fluid tank at temperatures up to 85°C (185°F), by brush or drip feed, or by a centralized lubrication system. 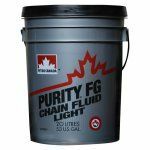 For the lubrication of chain and conveyor systems requiring a higher viscosity fluid, PURITY FG Chain Fluid Light or Chain Fluid Heavy is recommended, reference IM-7896 Tech Data. PURITY FG WO oils may be safely used where an approved food grade or inert white mineral oil is required. General applications include incidental food contact in producing, manufacturing, processing, treating or packaging food. Prior to application (spraying) of the products in food handling areas, all food products should either be removed from the vicinity or otherwise protected from the spray.